The New Medical Spa MD Guide To Aesthetic Laser Platforms Is Out! 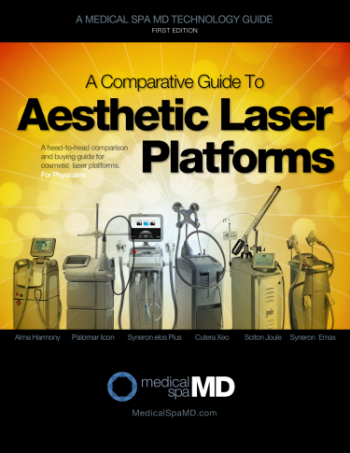 The Comparative Guide to Aesthetic Laser Platforms is now available for free to all Medical Spa MD Members. Choosing which aesthetic platform you're going to build your clinic or medical spa around is one of the most important, and expensive, decisions that you're going to make. Switching costs are high and if you make a mistake, you're going to be regretting it for a long, long time. This first edition guide offers a starting point for physicians and clinics who are just beginning to research the purchase of a platform, or as a resource for dotors who are in the market but want to know what else might be available. We've done much of the preliminary leg work for you by taking six popular platfroms from Palomar, Sciton, Alma, Cutera and Syneron and comparing them across a number of treatment modalities. We've also included links throughout the guide to the discussion forums on each platform for deeper investigation that allows you to ask questions directly from other physicians who own that specific laser, as well as discuss other important purchasing decisions around consumables (which can be a significant cost) and support (which can be critical). Note: While there are dozens of laser and IPL systems that might have been included, we started with thise six since they're all "multi-purpose" platforms with wide utility, widely available around the world, and are generally well known. If you represent a cosmetic laser company and would like to be included in future reports, please contact us. Do you have a suggestion to improve our services or an idea for as research project you think we should be doing? Would you like to be interviewed, or sponsor a report? Please contact us. Our contributing physician list is growing fast. Thank you to the physicians and clinics who have contributed to this report. Also: Please feel free to distribute, email, link to, tweet, post or send this report to anyone who may be interested as long as you do not modify or change the report in any way.